Mesoporous graphitic carbon nitride (MCN) is shown to be a viable sorbent for the enrichment of sulfonamides (SAs). To overcome the difficulty of separating the sorbent from the matrix, a novel type kind of column-assisted dispersive solid-phase extraction (CA-dSPE) method was designed. 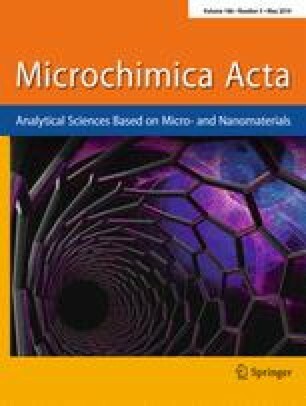 The MCN was characterized by scanning electron microscopy, high-resolution transmission electron microscopy, X-ray diffraction, fourier transform infrared spectroscopy and nitrogen adsorption-desorption measurements. The amount of sorbent, the pH value of the sample, the adsorption time, type and volume of the eluent and desorption time were optimized. The SAs were eluted from the sorbent with elution solvent of methanol containing 10% (v/v) ammonia and then submitted to HPLC analysis. Under the optimized conditions, the limits of detection for the SAs investigated (sulfadiazine, sulfameter, sulfachloropyridazine, sulfabenzamide and sulfadimethoxine) range from 20 to 5 pg·mL−1. Satisfactory recoveries were obtained for spiked environmental water (90.1–110.5%) and milk samples (82.3–102.7%), with relative standard deviations of 0.5–3.8% and 1.1–4.4%, respectively. The method is simple, time saving and sensitive. 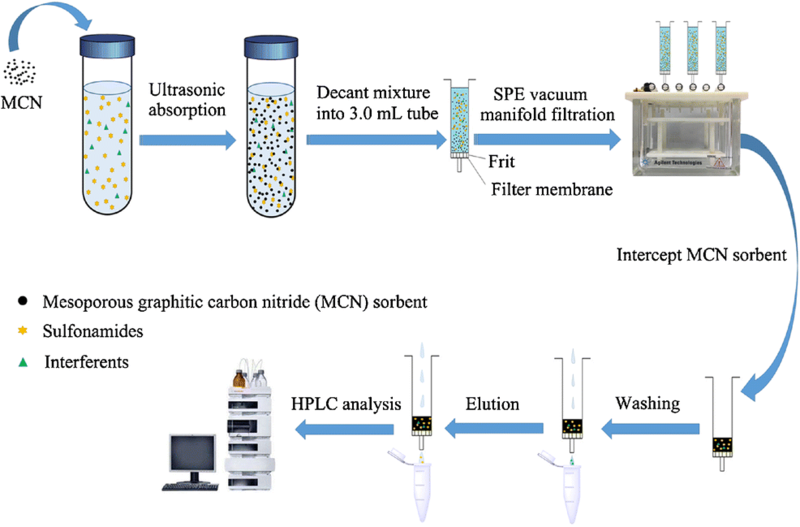 Schematic presentation of a column assisted dispersive solid-phase extraction by using mesoporous graphitic carbon nitride as sorbent combined with high performance liquid chromatography for sensitive analysis of sulfonamides in environmental water and milk samples. The online version of this article ( https://doi.org/10.1007/s00604-019-3394-9) contains supplementary material, which is available to authorized users. This work was supported by the National Nature Science Foundation of China (21477033), Program for Science & Technology Innovation Talents in Universities of Henan Province (17HASTIT003), and the Program for Development in Science and Technology of Henan Province (172102310608).